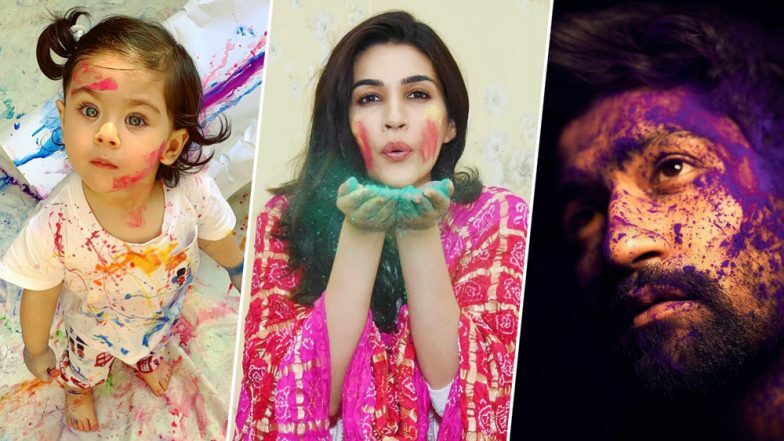 Holi 2019: Inaaya Naumi Kemmu, Kriti Sanon, Vicky Kaushal's Colourful Instagram Pictures Perfectly Define The Festive Spirit of the Day! The festival of Holi is celebrated today in India and otherwise known as the festival of colours, this day is all about spreading joy and having fun along with your loved ones as you play with colors. Several Bollywood celebrities took to social media today morning to wish their fans. Celebrities are enjoying this festive day by organizing Holi parties and more. Taking to Instagram, several Bollywood stars wished their fans and even managed to share their lovely Holi pictures as they were smeared in colors. It was a delight to see little Inaaya all colored up in the festive spirit as she played Holi. Her adorable picture was shared by Soha Ali Khan which also sent Holi wishes to everyone. Actress Kriti Sanon too shared some lovely pictures of her enjoying with colors. Vicky Kaushal too managed to send his fans in a tizzy with a gorgeous picture of himself from a GQ photo shoot. The picture had him in a close-up shot with purple colour smeared across his face. Apart from them, other B-town celebs such as Madhuri Dixit Nene, Farah Khan, Diana Penty also celebrated Holi along with their family and friends. Here's taking a look at some of the best Instagram posts of celebs from Holi 2019. Esha Deol Holi Party 2019: Rannvijay Singha, Ayan Mukerji Smeared in 'Gulaal' Join the Celebrations, View Pics! Soha Ali Khan shared one of the most adorable pictures of the day as we saw little Inaaya Naumi Kemmu all drenched in colours as she enjoyed the Holi festival. Earlier in the day, we even saw pictures of her cousin, Taimur Ali Khan having fun with a water gun on the festival. Kriti Sanon too looked adorable as she posted playful pictures of herself enjoying Holi as she played with colours. The actress was seen giving some cute poses. Take notes, for your next Holi picture from her! Javed Akhtar's Holi Party 2019: From Shabana Azmi's Dancing Poses to Shibani Dandekar and Farhan Akhtar's Festive Fun - View Pics! Vicky Kaushal shared an intense picture of him from his GQ photoshoot. The actor looks amazing in this close-up with his face smeared with purple colour. We loved Diana Penty's fun Boomerang for wishing her fans Happy Holi. The actress is seen blowing colours off her hand and looks like she's having fun in the festive atmosphere. Madhuri Dixit Nene too took to Instagram to wish her fans for the festival of Holi and it seemed the actress enjoyed a gread deal with her family. In the picture, she was seen along with her husband and her kids as all of them were smeared in colours. Kajol also took to Instagram to share a lovely picture with mom Tanuja and her sister Tanisha. All three of them were sporting little bit of 'Gulaal' and Kajol wrote a lovely message along with it saying, "Happiness begins with people and family." Director Farah Khan who is along with her kids in Jaipur posted an amazing picture of her triplets enjoying Holi. They are seen jumping with joy after playing Holi with colors. Bollywood definitely channeled in their Holi spirit well and have made sure that we don't miss out on all the festive fun they are having. We are definitely looking forward to some more fun pictures of our favorite Bollywood celebs.